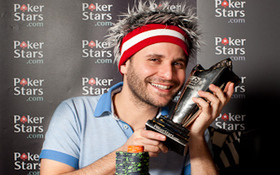 Roberto Romanello is the EPT Prague Main Event Champion. Romanello was amongst the chip leaders from as early as Day 1b and after defeating Emilliano Bono heads-up he now has the trophy, the title and €640,000 in his bank balance. Those searching for the Betfair Promo Code should note that he started the final table in fifth place but ended it with all of the 16,890,000 chips in play after a fantastic display of poker. Romanello is one of the most popular players on the circuit. His mixture of skilful poker play and witty banter make him a must for feature tables in these events. Prague was no different as he played and talked his way through a tough field of 563 players littered with some of Europe’s brightest talents. Those often studying the Betfair Promotions note that this was Romanello’s biggest score to date, dwarfing the €200,000 he won in a tournament back in 2009. Maybe the win was on the cards after finishing 6th at EPT Copenhagen last year and cashing in at 39th place a few weeks ago at EPT Barcelona showing his calibre in EPT events. What was fantastic to see was the emotion Romanello showed after his victory. In the final hand of heads up play Romanello opened for 575,000 from the button and Emilliano Bono three-bet to 2.475 million. Romanello announced he was all-in and Bono called. Romanello held TsTc and Bono held AdJc. The dealer laid out the perfect flop for Romanello, Td 4c 4d, and a 5h turn and 4h river secured the victory for the Welshman who was in a flood of tears. As part of his prize Romanello also wins a seat worth €10,000 to this season’s EPT Grand Final, to be held in the spring of 2011. Bono, 35, from Rome, earned €435,000 for second place. This entry was posted on Monday, December 20th, 2010 at 1:10 pm and is filed under Poker News. You can follow any responses to this entry through the RSS 2.0 feed. You can leave a response, or trackback from your own site.